In today’s world, a lack of computer knowledge can be the difference between getting a job and being unemployed or can impair you from communicating with those far from you. Our classes can help you bridge that divide inexpensively and without a huge time commitment. Our classes are designed for the true beginner, as well as for the intermediate user who is looking to improve his or her existing skills. A small fee (between $10 and $15). A library card in good standing. We make all of our class materials available online for free, such as our lesson plans and practice exercises. While the materials are optimized for instruction in the Computer Lab, many of the concepts can be transferred to other computers with different software configurations. Classes cost $5 per session. Each class consists of one to three sessions. 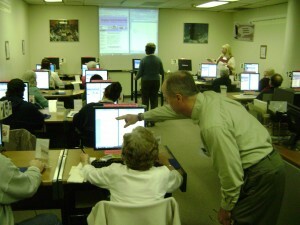 For example, our Computer Basics class consists of two sessions, so it costs $10. How do I enroll in a computer class? Registration must be done in-person at the Computer Lab. It cannot be done over the phone. Payment (cash or check) must be made at the time of registration. Do your classes start at the very beginning, like how to turn the computer on? We do not teach you how to set up a computer and turn it on. Computer Basics, our introductory course, presents the various components of a computer and includes instruction in using a mouse and keyboard. It introduces students to the basics of working in the Windows environment including the desktop, start menu, opening programs and manipulating windows. What if I can’t make all the class sessions in a course? We ask that you not enroll if you know in advance that you will miss a class session. Our classes are in very high demand and we prefer to enroll only those who are able to make a commitment to attend all classes. What if I want to start at the very beginning and the classes are filled? We can place your name on a waiting list. If someone drops out before the first session starts we will start calling names on the list in chronological order. If the slot opens at the last minute we will call names until we can speak to someone on the list. If we have more time, we’ll leave messages and accept the first call-back. What if I don’t need to start at the very beginning? Can I skip some classes? The skills taught in Computer Basics are the minimum required for most of our other courses. If you wish to bypass the Computer Basics course, you will need to demonstrate a basic computing skillset in the lab. The skills test takes 10-15 minutes to complete. Can I practice in between classes? We have developed support materials such as lesson plans, guides, and tutorials to utilize as you study. While we may be able answer a few questions if you are really stuck, practice sessions are primarily self-study. You can always bring your questions to the next class. Can I bring someone to class to help me? In our experience this does not work well. It can be distracting to other students and to the teacher. We typically have a teacher’s helper during class who can provide individual assistance to a certain degree. What if I want to complete the entire series without attending any classes? All of our lesson plans and course materials are available online at www.mc-npl.org/class-resources. However, if you have questions, we cannot provide assistance beyond how to access the materials, nor can we proctor proficiency tests or issue any certificates. Our lesson plans are tailored for Windows 10, Microsoft Office 2016, and Firefox. We also have certain settings on our Lab computers which may not look or behave like the software on your home computer.